Most of the time, you just need a quiet space to sit and work. And your co-working space is a great way to meet that need. But co-working spaces are more than just a desk and cup of free coffee. Co-working spaces provide several avenues into your local community that can help you build networks and a generate a balanced work-life mix. 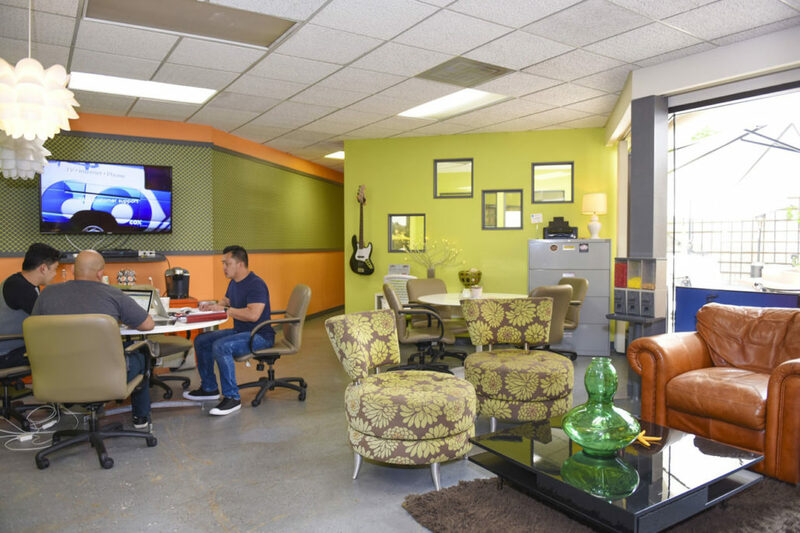 As a member of a co-working space, you have access to the meeting rooms and common areas. But if you are a solo entrepreneur, you might never really use your meeting room allotment. So, if your focus is on having a quiet desk space, you might let your meeting room hours go unused month after month. But for some non-profit organizations, affordable, comfortable, and professional meeting rooms are hard to find. If you are a volunteer or board member for a local non-profit organization, you can offer your meeting room hours to the non-profit for a board meeting or educational seminar. Most non-profit boards meet monthly during off-hours – like on a Thursday night from 7pm to 9pm. Your co-working space is probably empty during those times anyway. Non-profit organizations frequently need a meeting space once a year for an eight-hour annual planning session. And again, those meetings are generally on a weekend when the co-working space is relatively empty. Many co-working spaces are available for member use 24 hours per day. But if you walk around a co-working space after 8 pm weekdays, or any time on the weekends, the space is going unused. While one primary benefit of co-working membership is the camaraderie that comes with being around other professionals, sometimes a quiet, empty room gives you the space you need to think, plan, and accomplish. In fact, if you haven’t made the leap to being a full-time entrepreneur, you might be able to negotiate a discounted rate for using the co-working space only during nights and weekends. Plus, when you use the co-working space during off hours, you can dress in sweat pants and a t-shirt. And maybe even bring the kids. If you aren’t going to the co-working member dinners and networking nights, then you are missing out on a prime benefit. To start, networking events are critical way to find more business. Sure, you might pick up a client or two from within the group of co-members. The key to finding business from a networking event, however, is honing your elevator speech down to a repeatable set of skills you offer. Everyone at the networking event knows someone else who needs your services. By attending the networking event and delivering a compelling elevator speech to ten other members, you are seeding the word-of-mouth marketing that leads to consistent, incoming business. Networking events also force you into much-needed social interaction. Introducing yourself to other members is difficult – especially during a busy workday. But when you add a glass of wine, some jazzy background music, and a cheese plate, suddenly it’s easier to say hello and introduce yourself. By building these social connections, you are creating a more comfortable workday environment for yourself. Co-working spaces often have well-established connections to the communities in which they operate. For example, your co-working space might already have a team for an upcoming 5K run to raise money. Or the co-working management might already be donating space to a local non-profit. These pre-established connections are a great way to get yourself and your business into the community. All businesses are built one brick at a time – so by attending the 5K sponsored by your co-working space, you are creating the goodwill that becomes word-of-mouth marketing and more client contracts. You can also bring a community event into your co-working space. Whether you are selling Girl Scout cookies for your daughter’s troupe or looking for volunteers to help clean the beach, you have a wealth of resources available through your co-working colleagues. You might be surprised at some of the amenities available to you as a member of your co-working space. A good co-working space will work to provide a healthy work-life balance to its members. Often that means shower facilities to enable a quick lunch-hour jog. You also might find that there are some exercise machines tucked away in an unseen corner of the office. Make sure to take full-advantage of the drinks and snacks available to members. Your co-working space isn’t really in the business of making a huge profit on the granola bars and club soda for sale at the snack bar; those snacks are there to help you be more productive while working. And if they aren’t carrying your favorite bottled water – ask! Management might be thrilled to add something new to the slate of offerings. Co-working spaces are built to make your life more productive. But the management team can’t read your mind. Don’t shy away from asking for want you want out of the space. It’s yours – you pay for it – so take advantage of all the features and benefits that come from co-working membership. Who uses CoWorking Spaces in San Diego?